Target Outcome MSTE: Students will enter text into Office Suite software and use basic formulas and layout/organizational strategies. Added Skill Set: The use of Alt+Tab to switch between open programs, copy and paste techniques, textbox creation, and internet research. 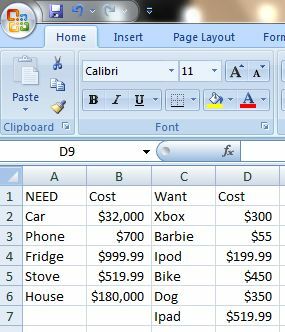 In Cell A1 type "NEED"
In Cell B1 type "Cost"
In Cell C1 type "Want"
In cell D1 type "Cost"
Now that all of your Powerpoint has successfully been entered into an Excel Budget Spreadsheet you can procede with the use of simple equations to tell you certain important information. In Cell E4 type "Expensive need" In E5 type "Expensive Want"
In Cell E6 type "Cheap need" In E7 type "Cheap Want"
In Cell E8 type "Total Needs" and in E9 type "Total Wants"
In Cell E10 type "Cost Difference"
In Cell E11 type "Average NEED" and in E12 type "Average Want"
Save both your powerpoint and spreadsheet and submit them to your teacher as directed. 2. Convert the cost to Australian or another country's currency using current exchange rate. ex: house might be 38% etc..